iiiEM has started “Global Travels” for all the aspiring enthusiasts who would be able to give wings to their dreams. 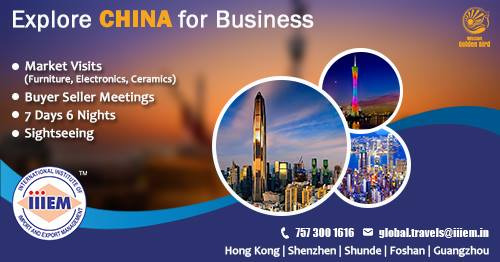 Global Travels arrange for guided business tours in foreign countries like, UAE., China, Malaysia, Thailand, Germany, Vietnam, USA and many more. These tours are organized for anyone who wants to or wishes to do business. Global Travels is a Trade Tour, restricted to business opportunities, international exhibitions, market visits, buyer – seller meetings and guidance on how to do export or import in a country.